Its time for a tour of duty in southeast Asia. Heroes of the Nam is a squad-level game with a fast-paced, intense impulse system that drops you right into the middle of furious jungle firefights, ambushes and all-out, building-to building assaults, in battles from 1963 to 1971, from Saigon to Hue. 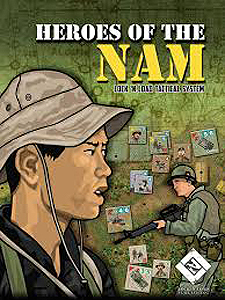 In Heroes of the Nam, a complete game in the Lock 'n Load Tactical series, forces from the Army of the Republic of Vietnam (ARVN), the United States Army and Marines, as well as their valiant Anzac allies from Australia and New Zealand, take on determined enemies from the North Vietnamese Army (NVA) and the unpredictable Viet Cong (VC). Powerfully armed squads are at the vanguard of all actions, spurred on bu daring Leaders and other unique individuals such as Snipers, Medics, Corpsmen, Chaplains, Advisors and, of course, Heroes, whose unique skills and sudden appearance can alter the tide of any battle. Helicopters, tanks and armoured-personal carriers (APCS) also join the fight. your Mettle.